Posted by Mary under Uncategorized, Washington D.C. 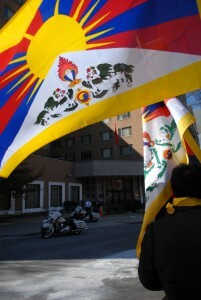 There was a march up Connecticut Avenue in Washington DC today by the campaign to free Tibet. You couldn’t miss their brightly coloured flags and clothing. The protesters headed up to the Chinese embassy where they held a rally in front of assorted police. No one came out from the embassy to greet them. March 10th marks the 50th anniversary of the Tibetan Uprising of 1959, when more than tens of thousands of Tibetans were killed by Chinese troops and the Dalai Lama fled over the mountains to India. It also marks one year since violent protests swept across Tibet. Today the Dalai Lama issued a strong statement charging China with creating “hell on earth” in Tibet, describing the “untold suffering and destruction” that Tibet has borne oveer the past 50 years. This received media coverage, but competition is fierce. Afterall this week also marks the 50th birthday of the Barbie doll. A couple of days ago a Tibetan Barbie doll was even launched by Chinese entrepreneurs. NSP Research – Updates is powered by	WordPress 2.9.2 and delivered to you in 0.245 seconds using 22 queries.